Pin it button on images. Put follow Pinterest button on website. This is very easy to setup and use plugin, has both shortcode and widget options. Make your content’s social reach to next level. Custom pin it button page display options. Options to add enable classes and disable classes for filtering the display of the pinit button. Pin it button position display options. Pin it image description source options to choose. Can setup minimum image size to show “Pin it” button. Options to show the pin it button on hover or always show. Native Pin it button for images settings. Pin it button configuration (size, shape). Pin it button color customization. Pin it button language selection. Follow Pinterest button for website. Lightweight – Installs in seconds. Super support – get support via email/support forum/online chat. 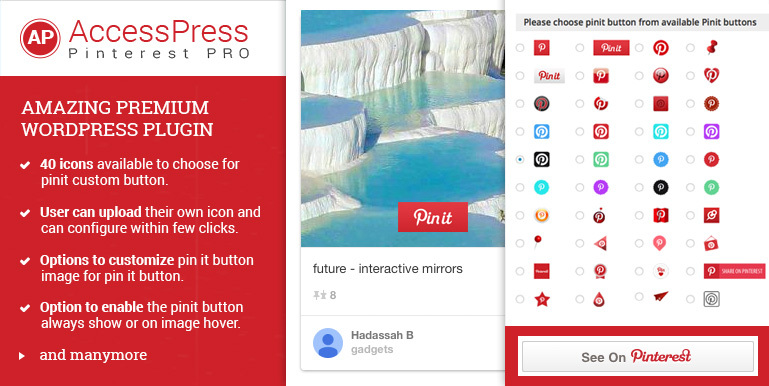 Hey Buddy!, I found this information for you: "Pinterest Plugin for WordPress – AccessPress Pinterest Pro". Here is the website link: https://access-keys.com/wordpress-plugins/accesspress-pinterest-pro/. Thank you.